Situated on Okruzni Street near the center of Spindleruv Mlyn, Hotel Domovina enjoys a prime location close to many recreational activities for every season. Within minutes of walking, you will be at the Svaty Petr ski area and the Medvedin ski lift of the Giant Mountains, where you can ski and snowboard, and take lessons at the ski and snowboard school. Ride up to the top of the bobsled track and toboggan run lighted in the evening, or enjoy a horse drawn carriage ride. In other seasons, you can enjoy the nearby aqua park and hiking trails. 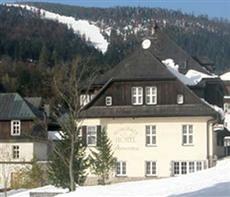 Hotel Domovina is housed in a beautiful historical building that has recently been renovated. It is family-owned and operated, and resonates an extremely warm and welcoming atmosphere. There is a restaurant where you can enjoy a delightful breakfast or dinner, and a small bar where you can enjoy a glass of rich Moravian wine. After a day of skiing, you can use the onsite ski room with a convenient ski boots dryer. Complimentary wireless Internet access is available on the premises.